this is where you can do all required actions for integration and test payment processing. we will provide you the access to production environment after you have successfully integrated to our test environment and processed a successful test payment. For security considerations we can only provide Portal production environment access to official merchant’s representative. The owner of the production account can then create additional users through Portal under Settings > Merchant Users. The only thing you need to provide is new user’s name and e-mail address and define the permissions that are needed. There are different permissions for different actions so you can choose which permissions suit best for every individual user. All settings are effective immediately. Also, once an account is set, you can always change (remove, add) the settings for particular Portal user if needed. If the user has not signed in to Portal for 90 days we will lock the account for security considerations. Expired account can still be opened by your Portal administrator through Portal Settings > Merchant Users. If you have forgotten your password you can easily ask for a new one. Go to the sign in page of the Portal and click “Forgot your password?” link and we will send you instructions on how to reset your password to the e-mail you used when you signed up. To keep your account secure, the password for signing in to the Portal will be valid for 90 days. If the password has expired we’ll inform you about it when you login next time and you can simply change the password during the login. 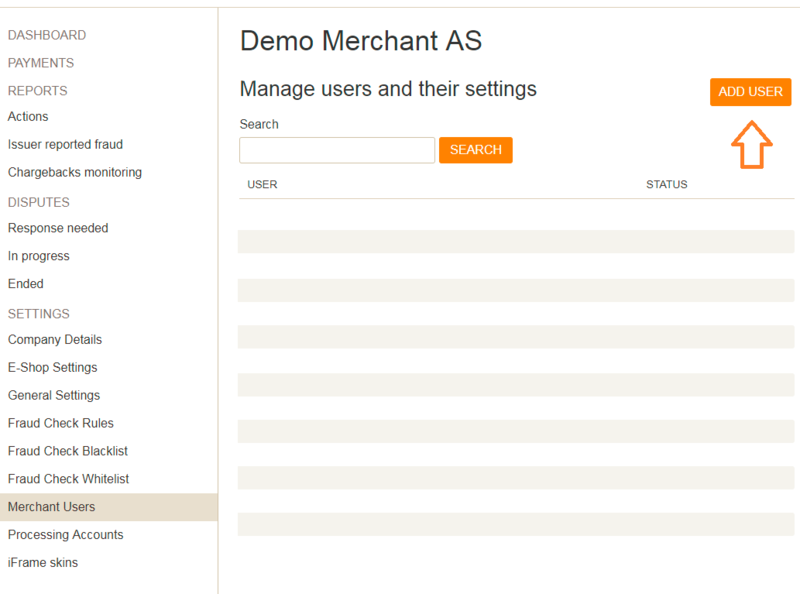 How to add users to the Merchant Portal? How to check/manage company and contact details? Information about setting up fraud check rules. We have developed a solution to reduce the probability of fraudulent transactions that may occur on your website. EveryPay Fraud Control Tool consists of a list of rules that can be used to perform a number of checks on the payment, resulting in a total score for each payment that represents the likelihood of the payment being from a fraudulent source. 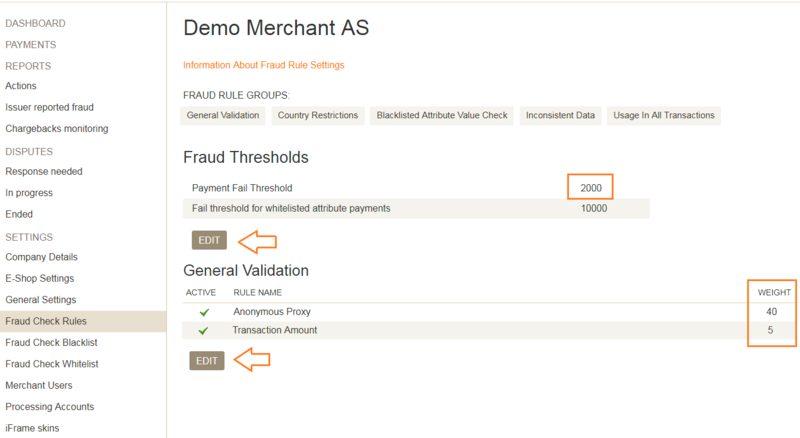 Fraud rules in EveryPay Portal can be configured under Settings -> Fraud Check Rules. We have provided a list of ready-made rules that can be turned on or off. By clicking you can see precise information about the certain rules. You can also set the weight for each rule. Rule descriptions are written under each rule name. Under Settings choose E-shop settings and choose the website you would like to edit. For adding Logo press button “Upload new logo” and insert your company logo that is in supported file format. Supported formats are jpg, jpeg, png and gif. The maximum size of the logo can be 200 KB, width must be at least 370px and height at least 150 px. After uploading the logo via Merchant Portal, it will appear on your payment page. If you are using our integrated payment form (iFrame) it can be fully integrated to your checkout page and customised to match your visual design. Using iFrame Skin settings you can change how the field labels will appear in iFrame, customize style and color for field names and design payment button appearance. 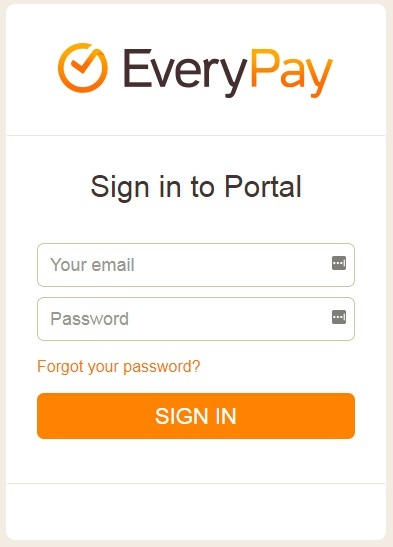 Integrated payment form can be customised directly from EveryPay Merchant Portal under iFrame skins settings. From Settings choose iFrame skins page. 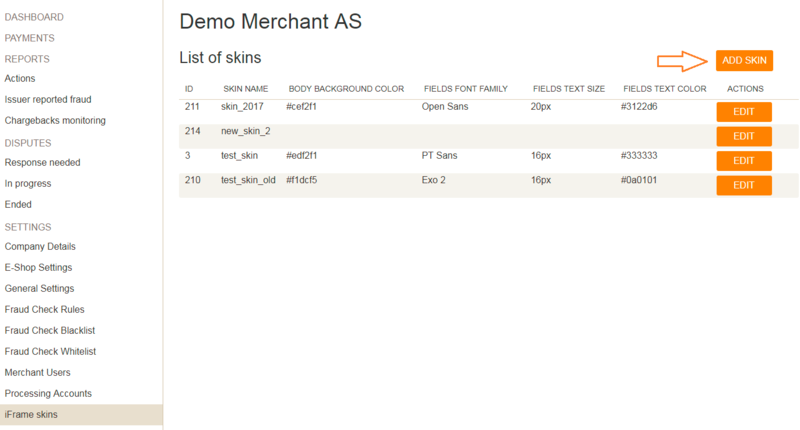 To add a new skin click “Add skin” and customise the skin the way you want it to be displayed to your customer. You can check the appearance changes simultaneously on the test window in the right corner. 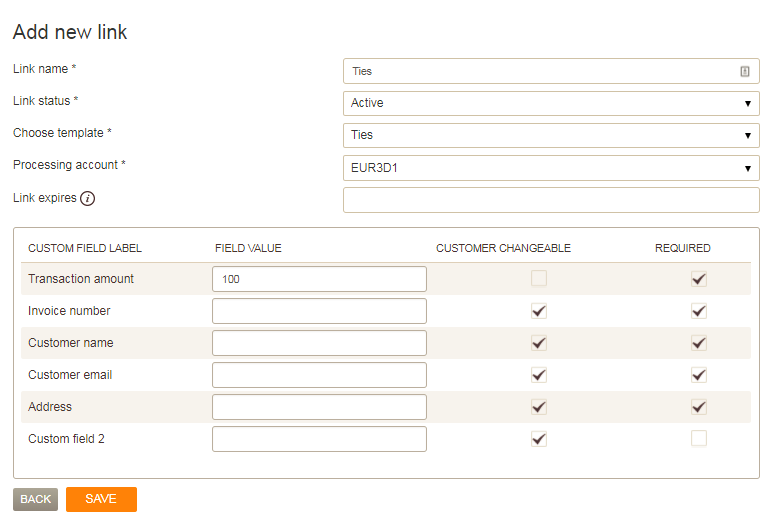 After defining the the skin name in EveryPay Portal you can specify the same name also on your e-shop platform module. Your customers will be then presented the payment page as designed by you. This feature allows you to create a convenient payment method for your regular customers by enabling to save their card details and making it possible for them to pay for goods with just “one click”. If you are using Magento, Woocommerce or Prestashop module for your e-shop platform, then enabling to store the card details for your customer is very easy. This functionality is is available via your e-shop platform EveryPay module and can be configured on Settings page. After enabling storing the card data, please inform also us by contacting support@every-pay.com and we will enable the functionality on our side also. With the help of ready-made filters a detailed report by currency, processing account, card type or payment status can be performed. You can use one or different filters to adjust your specific task. 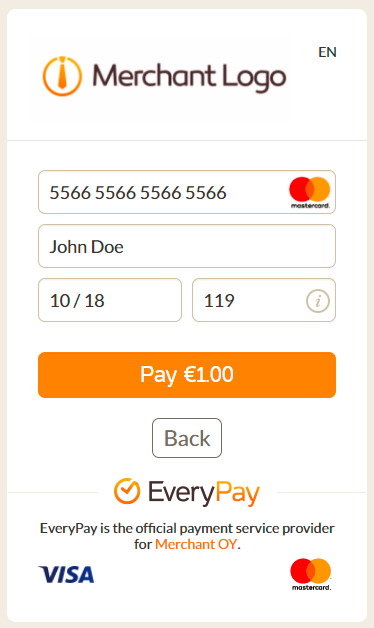 For example if you want to see all refunded payments in euros for Visa cards for the last month you can easily filter out the required values and our Portal will promptly display you the results. If needed an easy search can be performed by the shopper’s name or e-mail address, we have provided a special field for that. Simply enter the customer’s name and we will quickly find all payments made by that customer. You can also combine search field with some of the filters. For example, find all settled payments for a particular customer. If needed you can also search for a specific payment by payment or order reference number. All required search results that you performed and were displayed to you in Portal can be exported to the CSV report. In a CSV report we have collected a lot more data about the payment. The report enables you to view the numerical breakdown for your payments by statuses, calculate payment success rate and total sales amount. You can also see daily or weekly trends of your payments or analyse your customers by issuer country or shopper country. As it happens, some of the payments also fail. CSV report enables you to easily take out all failed payments with the corresponding reasoncodes. It allows you to analyse the failure reasons and find ways to improve success rate. On payment details page we have provided possibility to see linked payment data based on IP address, e-mail address or cardholder name usage. You can simply click on the aforenamed value and as a result all payments or payment attempts performed with the given value will be displayed to you. It will help you quickly analyse particular customer behavior. Seeing linked payment data is also valuable input for checking suspicious activity. By clicking particular IP or e-mail value you receive all payments over the history performed with that value. It enables you to estimate if there is risk related (many attempts over a short period might be indicator of fraud) and act accordingly – either by voiding or refunding the payment. During its lifecycle a payment goes through different statuses. Each status indicates a specific phase for the payment, there are different actions that can be performed during each status. The table below gives you an overview of the payment statuses that are used in EveryPay. It will help you to understand which statuses to monitor or analyse more thoroughly or in which phase and how you could help a customer if needed. An initialization of the payment. A process whereby card Issuer approves or declines the use of the card for a particular purchase transaction at a merchant. If the authorization is successful the purchase amount will be reserved on the cardholder’s account. In case of 3DS payments the authorization process also involves cardholder authentication*. When 3DS authentication window was prompted, the customer closed it or pressed the Back button. The payment was not completed. Customer has 15 minutes to perform 3DS authentication. If the time is exceeded and 3DS authentication is not finalised the payment status is changed from ‘Waiting for 3DS‘ to ‘Abandoned‘. It is Final status and means failed payment. Authorization was declined by card issuer or some technical error occurred during authorization process. This is the final status of the payment. Cancellation of authorization. Void blocks funds transfer for an authorized payment. This is the final status of the payment. Reimbursement of the payment. Transaction amount is transferred from the merchant to the buyer. This is the final status of the payment. Settlement of the transaction, acquirer bank has transferred the funds to the merchant’s bank account. Cardholder has disputed a payment and Issuer bank has initiated a chargeback process. * Authentication: A process whereby card Issuer assures that the presenter of the card is a valid card owner. As a self-service platform EveryPay Merchant Portal allows you to void or refund payment when such need arises. The action can be performed under Payment Details by selecting the relevant button. Information about performed action will be then automatically forwarded to your bank who does the required actions on their side. Void and Refund actions can not be reversed. refund can be done for already settled payment. Void transaction reverses an authorised payment that has not been captured yet. By default all payments performed during the day (between 0:00 and 23:59 UTC+2) are automatically captured by EveryPay past midnight. Like authorisation , void is also an online request to issuer bank that cancels previous authorisation and the funds that got blocked within authorisation will be released. Voided transaction does not go through the settlement – merchant does not receive money for that transaction and cardholder is not debited for the transaction. Voiding a payment is a useful tool for mitigating risks in case fraudulent transactions. After the payment has been captured and settled but needs to be returned to cardholder this can be performed with refund transaction. A payment can be refunded in full or partial amount. Always use Refunding a card transaction when initial payment was done with a card. This eliminates unnecessary disputes (chargebacks) as original transaction and refund can be linked. 3-D Secure is a card authentication anti-fraud protocol developed by Visa and MasterCard to verify a shopper’s identity during online shopping and before merchant submits an authorization request. 3DS statuses indicate whether and how the payment should be processed and also define who has the liability in case of fraud related chargebacks. 3DS Fully authenticated 3DS payment, cardholder was successfully authenticated. In case of fraud-related disputes the liability shifts to issuer. 3DS Failed Issuer is not able to authenticate the cardholder as the cardholder’s password (or other authentication information) failed or cardholder has disabled the 3DS authentication. As a failed authentication result the payment is also failed. 3DS Attempted Merchant attempted to authenticate the cardholder but was unable because either the issuer or the cardholder is not participating in 3DS or issuer’s authentication server is not responding. In case of fraud-related disputes the liability shifts to the issuer. No 3DS Cardholder enrollment or authentication could not be performed due to system failure. Payment is processed without 3DS authentication. CB liability is at merchant side. Card payment is a communication between card issuing and acquiring bank. 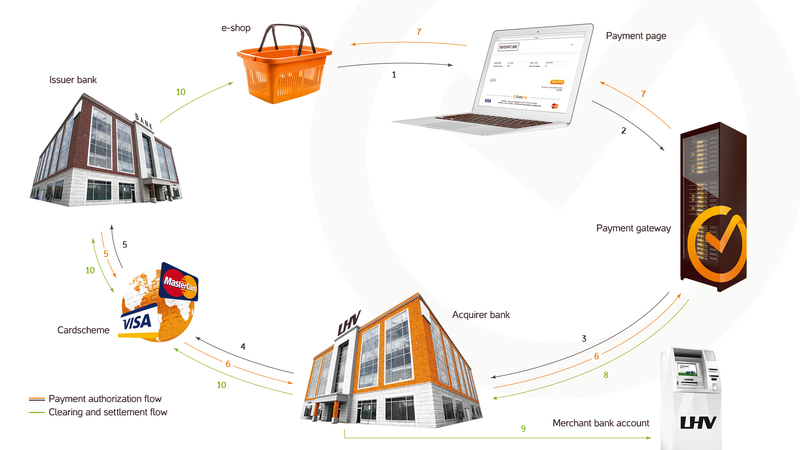 The following picture gives an overview of how to payment flow works. Buyer initiates a payment at an e-shop and enters card details on the payment page. Merchant forwards the data to a payment gateway using a secure channel. Payment gateway puts the data into authorization message in the format required by cardschemes and then, using a secure channel, forwards the authorization message to acquirer bank / bank’s processor. Acquirer passes the authorization request to cardschemes (Visa or MasterCard), who will forward the data to the issuer bank. Card issuer accepts or declines the authorization request and sends its response to cardschemes. Cardscheme forwards issuer response to acquirer bank who will then pass the result to a payment gateway. Payment gateway updates the payment data and forwards the results to Merchant e-shop which will present the outcome of the authorization request – either approval or decline – to cardholder. EveryPay compiles a capture file to forward it to the acquirer bank. 9.-10. Acquirer transfers purchase amount to merchant’s bank account and sends a clearing request to the issuer who will then charge the cardholder. 2. see the error message description on Payment data page 3. fetch the CSV report which also enables you to analyse the failure reasons during the longer period. If the card issuer has provided a specific reason why the payment was declined then the failure reason will be displayed also to the cardholder on a payment page. 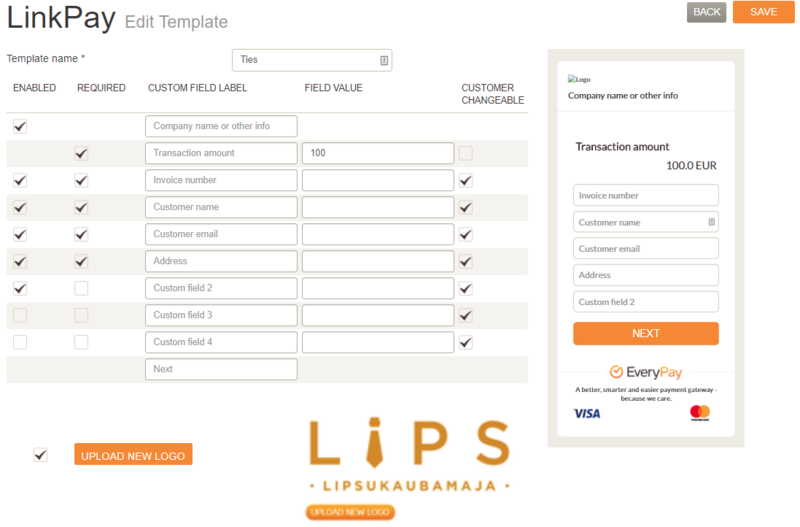 In order to send LinkPay payments a Template must be created first to define all fields that you want to show for customer and also define whether the field can be changed by customer while making the payment. Additionally to standard fields like company name, transaction amount, invoice number, customer data, also any other information can be added or asked from customer to fill in on Custom fields. Field name can be set by you what best fits to your usecase. To get the LinkPay form having visual design more natural to your company or brand you can use your logo or banner on the LinkPay page. Supported files: jpg, jpeg, png, gif. You can use custom text on Button if needed. Required field indicates whether the field is mandatory to be filled in by customer or not. Don’t forget to save changes when adding or removing any data. After creating a Template now the links can be created. Choose template dropdown gives you the list of previously created templates. Define the Processing account to indicate the currency you want the payments to be processed with. The values defined within Template can be overwritten if needed. Any changes made on Link attributes or settings does not affect data defined on Template. Cardholder disputes a payment with issuer. Information about disputed payment is processed through cardschemes to acquirer bank. Although you probably cannot avoid chargebacks completely, you can take steps to reduce or prevent them. If a cardholder with a valid dispute contacts you directly, act promptly to resolve the situation. Issue a refund, as appropriate, and send a note to let the cardholder know about your decision. This will help to avoid possible chargeback and save the related costs of the chargeback. If the issuer bank contacts you directly please consult with your bank regarding the response. Acquirer knows the rules and knows the best scenario how to handle the information request to prevent possible chargeback. Always send your acquirer as much information as possible to help remedy the chargeback. With appropriate information, your bank may be able to resubmit (re-present) the item to the card issuer for payment. Timeliness is also essential as each step in a chargeback cycle has a defined time limit during which action can be taken. Monitor your transactions and set rules to avoid accepting fraudulent payments. If the transaction seems suspicious try to contact the cardholder in order to be sure it is not fraud. If you believe there is fraud don’t deliver the merchandise, void the authorisation or if the payment has been captured already, refund the transaction amount. That way you can be sure that you have protected yourself against a possible chargeback. Provide complete description of good or services. Provide order tracking and delivery info if goods were shipped to customer (courier company info, courier employee name, shipping address, delivery time etc). Provide return, refund and cancellation policy where appropriate. The quality of the provided copy must be clear. In order to be able to assist with the dispute please respond within 10 days.